Brand new in box. US Import. 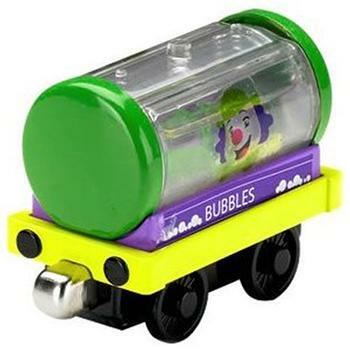 Fisher-Price Thomas & Friends Bubbles Car. A durable die-cast trailer car perfect for Thomas and all his friends. The bubble car features fun bubble wands in "bubble solution!" Complete with Mr. Bubbles logo from the show on the front. Connects to die-cast vehciles either way. Compatible with take-n-play playsets.